Today it snowed. Again. I really never thought I would be so tired of the snow. But I am. As I was driving one of the guys to Wal-Mart, and it was snowing on us, I muttered, "I am sooo ready for this snow to be gone." And he responded something along the lines of the snow and blizzard and -30 windchill are just Mother Nature's way of repaying us for what we are doing to the environment. Hmmm, I could just let this go and keep driving, or I could delve a little deeper and see where this conversation might lead. So I say, "Huh? What do you mean?" "The way I see it, we have destroyed the ecosystems of the three largest continents on the earth." - Let me interject here, that I for one was shocked by his usage of the words ecosystems and continents and had a hope for just a mere second that this might just be a semi-intelligent conversation; but that was but a fleeting hope. He went on, "From what I know, there are a lot of people that are trying to help solve this problem and I am thinking about donating some of my money to help them. Did you know that polar bears are almost extinct? Something has to be done about that. I mean, how sad would it be for there to be no more polar bears? See, the biggest problem with all that is that polar bears are the main things that Coca-Cola uses for their advertisements. And if there are no more polar bears, then what can they use? Pandas?? I don't think that would work so well, do you? And then if Coke can't use polar bears, then they can't advertise and then they will end up going out of business and there will be no more Coke products anywhere." Yep - that was pretty much the conversation. 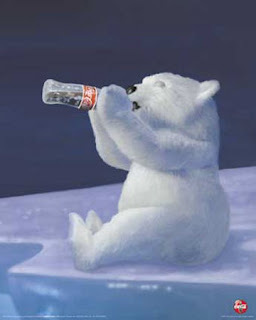 In layman's terms - global warming = polar bear extinction = the end of the Coca Cola corporation. Interesting theory huh? I didn't bother mentioning that Coke's been pretty successful long before the polar bears, or that the polar bears they use aren't even real - not like they're paid actors. I started to argue, but then I remembered that these words came out of the mouth of a guy who just minutes before his monologue asked the question, "Wouldn't it be amazing if we could use both sides of our brain? Just think of all the things we could do and know." Yeah. That sure would be amazing. But we're not gonna hold out any hope of that happening any time soon. that is too funny. when people make commenst like that I just let them go or I know what is coming next like the lecture you got from that guy..lol. and on a side note, no I didn't know there was a polar bear=global warming connection. But that makes sense now as my son's preschool class is collecting money to save the polar bears. I was confused as to why they were doing that and now I know i guess...lol. OMGoodness ... that it to funny! I'm not sure I could have remained straight faced through that conversation. I've heard that this is turning out to be one of the worst winters in a long, long time. Not so sure about that whole GLOBAL WARMING THING!